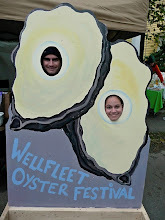 Join GoShuckAnOyster.com staff as we bring our families to enjoy $1.25 oysters in Foxboro Massachusetts to support Down Syndrome and Team 21 at the Rock-N-Dock Festival during May 30 - June 2, 2013. This is a great event for children and parents who love dogs. Come see dogs compete in Big Air®, Extreme Vertical™ and Speed Retrieve™. 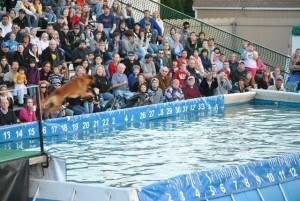 This DockDogs® competition, which is being hosted by Bass Pro Shops, is free to the public. Food, vendors and activities will be a part of the 4-day festival. Families with children and dogs are welcome to come and enjoy the festivities! The hours are Thursday from 4:00pm – 8:00pm, Friday 9:30am - 8:00pm, Saturday 9:30am - 4:00pm and Sunday 9:30am - 5:00pm. Will there be oysters at the event? Yes. Big Rock Oyster Company will be onsite shucking and selling oysters and littlenecks. Big Rock Oyster Company is located in East Dennis, Massachusetts. Big Rock provides oysters to some of the finest restaurants in Massachusetts including Island Creek Oyster Bar and Legal Seafoods. Big Rock also provides raw bars to events throughout Massachusetts. You may pre-order oysters to pick up and take home. What is a Rock-N-Dock Festival? The festival will feature an exciting outdoor DockDogs® competition on all four days. DockDogs® is the world’s premier canine aquatics competition, with dogs from all over the country competing in three different categories: Big Air®, Extreme Vertical™ and Speed Retrieve™. The dog with the highest combination of scores in all three categories will earn the title of Iron Dog. All three current world record holding dogs will compete at the Rock-N-Dock festival. These high-flying competing dogs can jump lengths up to thirty feet and over eight feet high! Team21 is a Stoughton-based non-profit organization whose mission is to raise awareness about the importance of early intervention programs in helping children with Down Syndrome live their fullest lives. Proceeds from the Rock-n-Dock Festival will benefit Team21, Children’s Hospital Boston Down Syndrome Programs and the Massachusetts Down Syndrome Congress. The event and the oysters will be next to Gillette Stadium in Foxboro, MA in front of the Bass Pro Shop. Plenty of free parking is available. Dogs allowed. Learn more at www.GoTeam21.org or contact Dave Skoletsky at dave.skoletsky@gmail.com or 508-444-8878. Tell him Josh from Go Shuck An Oyster sent you.